Click here to read more details on our Facebook Event! -Free! 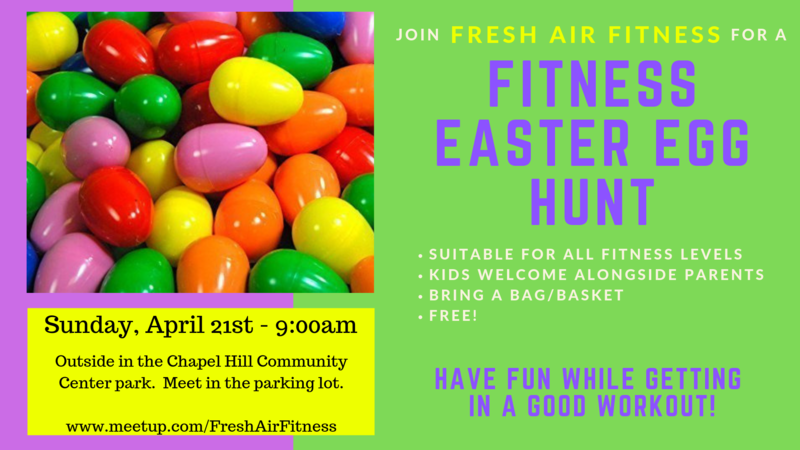 -Open to everyone, suitable for all fitness levels -Kids are welcome to participate alongside their parents -Bring a bag or basket -Meet in the parking lot of the Chapel Hill Community Center Approximately 600 plastic eggs will be hidden all around the park, each containing an exercise/# of reps to complete. Participants will locate an egg, open it, complete the exercise, then put the egg in their bag before moving on to the next. A few eggs will have special surprises in them! This workout is aimed for adults but kids who are old enough to understand the rules (not just run around and grab all the eggs) are welcome to participate independently and younger kiddos can participate alongside parents as part of a 'family team'. This is a fun workout that anyone can achieve at their own pace - so spread the word!